Caren Althauser is a Program Officer at PATH, a global health non-governmental organization driving transformative health innovations to save lives. Ms. Althauser is a Technical Facilitator for the Joint Learning Network for Universal Health Coverage’s Information Technology Initiative, which works with countries in Africa and Asia to establish universal health coverage systems through cross-country learning and collaboration. 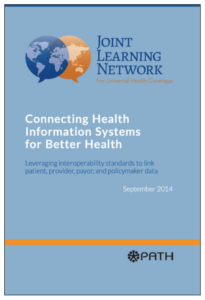 PATH produces educational resource documents about best practices for health management information systems for a project with the Joint Learning Network for Universal Health Coverage. The documents are designed for health information technology (IT) leaders and policymakers in the developing world. Caren worked with Pressbooks to produce PATH’s latest project in Web, ebook and PDF formats. Download the PDF (created on Pressbooks). Q. Why is the Web so critical to disseminating this information? A. Historically we’ve produced documents in PDF format that are available to download from our website. We also print white papers and booklets to be distributed at conferences and workshops. We wanted to explore making these resources available in multiple formats and channels to increase accessibility. Feedback from our readers indicated they often prefer the paper copies because they have challenges downloading large PDF documents when Internet connectivity is limited or slow. Most of these readers have smart phones or iPads and would be able to view documents in a Web or ebook format, so we wanted to give them additional options. And, since our content topics are related to using technology to enable efficiency, publishing an ebook was a great opportunity to “practice what we preach” and demonstrate using technology to move from paper to electronic forms of content. Q. This project was a radical departure from your usual process of creating documentation, so I imagine the learning curve was rather steep: Given that, what are your thoughts about the potential in the world of NGOs for getting information out in multiple formats from one source? A. This was our first ebook project, so we expected there would be a learning curve. However, we knew we wanted to focus on the output being available in the new (to us) electronic formats rather than on the authoring and production process. So we made the decision to produce our draft document outside of Pressbooks and then used conversion services from Pressbooks to upload the document and produce the output files for us. That worked well for us and allowed us to minimize the learning curve for creating our document. We know there are some great capabilities within Pressbooks for writing and reviewing content that we could leverage for a next book project. Other projects within PATH also produce reports and educational material for audiences all over the world. Getting consistent information out in multiple formats to better serve our target audiences is always a challenge. We think ebooks could be a great way to provide an additional access option for our readers and we are sharing our ebook experience with colleagues to pass on what we’ve learned. Q. What has been the best part about using Pressbooks to produce this type of health documentation? A. I didn’t have any experience with ebooks other than personally reading books on my Kindle. For this project, I wanted to be sure we could still produce what we have in the past, a PDF file that could be downloaded from our website. We planned to introduce the new electronic formats to our readers as optional new features so we could “test the waters” with publishing an ebook and see if it could increase our readers access and use of the book content. Pressbooks easily supported our baseline requirements for the PDF file and we were thrilled with the look and layout of all three formats (PDF, Web, and ebook). We also took advantage of some of the capabilities the Web format offered, incorporating video interviews with eHealth experts directly into the book. These video clips turned out great and it was exciting to see the book come alive with multimedia. We are also excited about the potential reduction in print costs, as that money can be redirected to higher impact uses. We were at a conference when we officially launched the new ebook and we had 200 printed copies of the book available, which were immediately snatched up. At another conference a month later, we printed only a postcard with the website address to access the book online, which saved thousands of dollars in print costs. Q. Did using Pressbooks enable you to produce this document faster, more affordably or more efficiently than previous publications? A. For our first ebook, I think it took about the same amount of time as it would have if we had just produced a PDF file. However, I can see where we will have efficiencies with a next ebook. For example, we spent additional time up front working with Hugh McGuire at Pressbooks to create a custom design template. We can reuse the template for future publications which will reduce our time required for design and formatting. Q. Does the simplicity of publishing documents like this across platforms with Pressbooks open the door for future similar works, and if so, what types of publications do you envision being able to create with the same method in the future? A. Yes, we will have future opportunities to produce similar documents intended for a wide-ranging audience and we look forward to publishing a next ebook. We launched our first ebook only a few months ago and we are still promoting it and encouraging our readers to access the book in the new electronic formats. We will monitor results to see what’s working, but the potential is really exciting.